Location, location, location. Our spacious1800 Atlantic 3 bedroom condo offers a fabulous view of the ocean from all three bedrooms and living room. Birds of various types, boating activities, lush oasis gardens are just a few reasons why people keep returning to our paradise property. "Click" on 'more information' also "click" on 'More info on Brad & Dee' to learn more about island. 1800 Atlantic is located in the middle of the Island on the Atlantic side. Two miles up is the Key West Airport and 2 miles south is the famous Mallory Square where the cruise ships dock. Off of Mallory Square is Duval Street where so many shops, bars, restaurants, and museums are located. Key West is a small island but we still recommend you renting a car, scooters, or even rent bicycles to get around to see it all. There are so many unique and great places to eat at or visit for entertainment. Every evening down at Mallory Square they have a Sunset Celebration. This is where people with unique talented skills perform also down here are many fun vendors who set up shop. Everyone watches and waits to see the sun dip into the ocean. Now for the nightlife to wakeup and begin. A Dentist for 40 years and not retired yet. We have been married for 44 years and have 6 children and 23 grandchildren. Brad is from Preston, Idaho and his wife Dee is from Southern California. We met at college. We were on vacation in Key West over 20 years ago. We live in the mountains so ocean and warmth looked very desirable. When on vacation we often like to look at real estate as a possible investment so look to learn what is out there. We thought at the time the price for a 2 bedroom was at 1800 Atlantic was good so bought it. Five years later this 3 bedroom came up for sale and so we sold the 2 bedroom and bought the 3 bedroom. That was before people put their property for rent on the internet fortunately now it's so much easier to rent properties out. We want to thank you for considering renting this property. We know you will love it like we do. 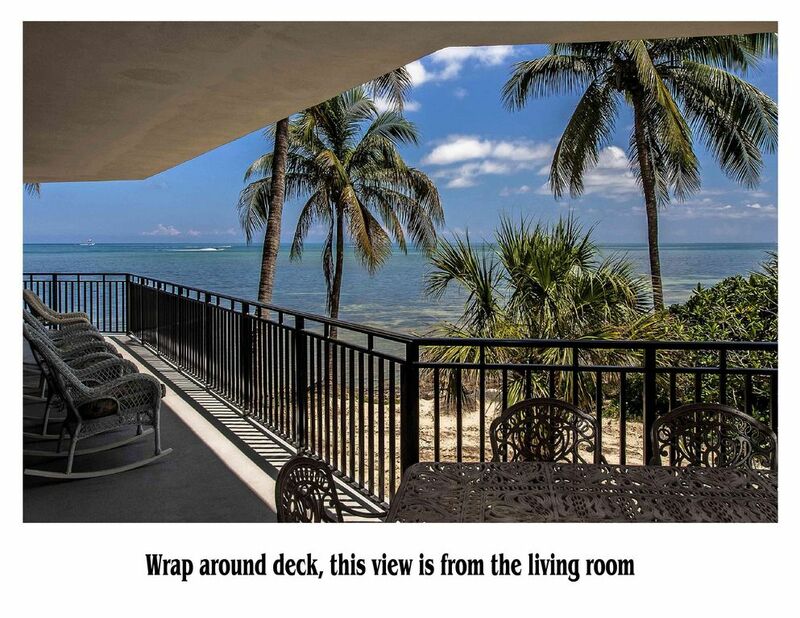 The best thing we like about Key West and this 3 bedroom condo at 1800 Atlantic is not only the breath taking view but also we love the quiet sereneness of this paradise spot. It's like being on Gilligan's Island, private but yet so close to the yummiest restaurants and multiple activities on the Island. After our renters book, we send them, by email, a list of activities of things to see and do as well as a list of many delicious restaurants to eat at while in Key West. We also occasionally fly in to Miami, spend the night there and look around the lovely 'happening" Miami. In the morning we make the beautiful 3 hour drive down to Key West. We love the aqua water, the tropical caribbean feel of the many little stops on the way down the keys, we love feeding the 5 foot long Tarpon fish at Robby's Boat Rental. We don't rush down but instead we stop, relax, smell the ocean, gaze out across the water and be reminded we are on vacation. As Jimmy buffet says, "it's 5:00 o'clock somewhere" and now you are on Island Time. The white sandy beach is directly below the condo's balcony. One person describe it as being on Gilligan's Island with views of tropical plants, white sand and aqua blue ocean. Newly added full fitness room in pool/courtyard area. All new machines in late 2017. Direct ocean front condo with direct ocean views from all 3 bedrooms, the living room and the kitchen. Different companies around island who rent Kayaks the closest being next door at Smather's Beach. wrap around deck which is accessible by sliding glass doors from all 3 bedrooms and the living room. There are so many things to do in Key West but one of our favorite activites is to sit on the condo deck and watch all the activities going on. Our location is in a very quiet scerene area with the feel of Gilligan"s Island yet out in the water are so many things going on to watch and enjoy. Plan each days event ahead of time so you can make reservations on different boats. Really though, it's a very relaxed atmosphere and there are so many enjoyable things to do without being on the water. Lots of museums, many beautiful and unique spots to take your pictures at, gardens to see, delicious restaurants to eat at. If you book with us we will send you our list of suggestions by email. This was our second time staying in this Condo. We brought along another couple this time for their first visit to Key West. There were 3 couples and we all had plenty of room and personal space. The Condo is always clean and well stocked and the location is perfect!! Everyone involved with the Condo are super friendly and very accommodating. We look forward to visiting again in the near future!! We all HIGHLY recommend this Condo if you are visiting Key West!! Beautiful place, very clean. Awesome views. Great location!! It’s only 1.5 miles from Duvall St. and allows some piece and quiet from all the traffic. The condo was exceptional, with a beautiful view from every room. It was very spacious and allowed plenty of room to accommodate three couples comfortably. I would definitely recommend this property to anyone looking to vacation in Key West. We so enjoyed staying at your condo. Everything was clean and well maintained but best of all was our views, the wrap around balcony and the quiet . This property provided everything it promised. We had 3 couples and it provided private bedrooms and bathrooms for each couple. Comfortable accomodations for times we stayed at the condo. The pool and hot tub are awesome. Security guy was super and Julia at the booking place was very helpful. You would never regret staying here. We would love to come back if we can make it work someday. The condo is gorgeous. Very nicely decorated and appointed. Great location right on the water. It is right next to the stairs to the ground floor one floor below and access to the fabulous pool and parking level. No need to go to a beach because the pool area is bordered by a sandy area next to the water. It couldn’t have been better. Plenty of luggage carts and an elevator make loading and unloading easy. Winter rates ........... $3699/week plus tax and check-in fee Spring & Summer rates .. $2900/week plus tax and check-in fee Most Holidays are more, call for rates Fall are our lowest rates, call for pricing We rent only from Saturday to Saturday. No Smoking No Pets Note: Until confirmed, rates are subject to change without notice.